Callistemon "Captain Cook"-The cultivar is a form of Callistemon viminalis which is normally a small tree with a weeping habit. C."Captain Cook", on the other hand, is a dense, bushy shrub 1.5 to 2 m tall by a similar spread. 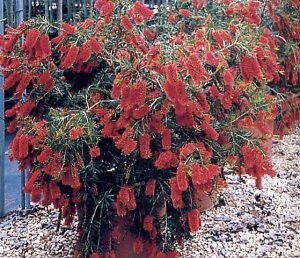 It has narrow leaves 50-60 mm long and produces masses of red brushes in mid to late spring (October to November). Flowers may also appear in late summer and autumn. In common with many callistemons, C."Captain Cook" can tolerate less than perfect drainage but usually performs best in gardens with reasonable drainage and regular availability of water. It responds well to annual fertilizing after flowering and is not as sensitive as some other Australian plants to phosphorus. It will withstand at least moderate frost and flowers best in a sunny position. Seeds germinate easily.